Jennie Dembowski is all about the details in her work as a graphic designer and in the kitchen. She is Puerto Rican and infuses her culture into her Cake Week signature bake by borrowing flavors from her family's favorite holiday drink, Coconut Eggnog. 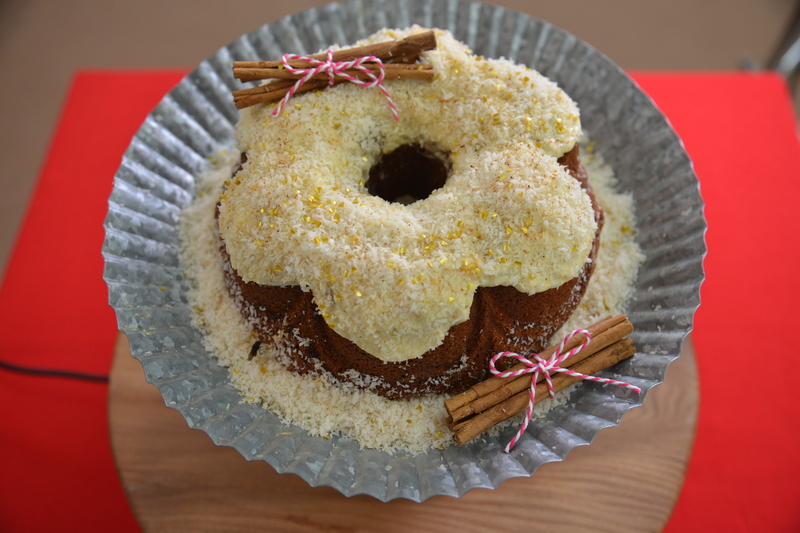 She pays tribute to her family with her Coconut Eggnog Winter Bundt cake recipe that is laced with rum. Watch the full episode of Cake Week from Season 2 Episode 2 of The Great American Baking Show to see how her signature bake turned out. 2. Make the streusel by mixing brown sugar with cinnamon, reserve mixture until ready to use. 3. Sift flour, baking powder, baking soda, and salt. Cream together butter and sugar until light and fluffy. Add eggs one at a time until incorporated. In a small bowl, whisk sour cream, coconut milk, sweetened condensed milk, vanilla extract, and coconut extract. Add flour and sour cream mixture to butter mixture in 3 additions, starting and ending with the flour. Add in rum and mix until batter comes together. 4. Pour about 1/3 of batter into prepared bundt pan. Sprinkle streusel filling evenly on top. Add another 1/3 of batter on top of streusel and with a stick, swirl streusel with layers of batter. Top with remaining 1/3 of batter. 5. Bake at 350º F / 180 º C for 45 minutes. 1. Warm milk and vanilla bean in sauce pan over low heat and bring to a boil. Whisk flour and corn starch in small bowl. In a separate small bowl whisk egg yolks and sugar, then whisk in flour/corn starch mixture. 2. Slowly about half of milk into egg mixture to temper whisking constantly, until smooth, then pour mixture back into saucepan. Whisk over medium heat until mixture thickens. Transfer to a shallow dish and refrigerate until cold. Once pastry cream is cold, cream softened butter, add pastry cream, and mix until smooth. Refrigerate until ready to use. 3. Top bundt cake with buttercream and a sprinkling of shredded coconut. Zest nutmeg on top and garnish with cinnamon sticks on the top left and bottom right corners of the cake. Sprinkle gold pearl dust on top to finish cake.